Cristiano Ronaldo may leave Manchester to play in Spain. The adjustment to his new team shouldn't be that hard having already shared a dressing room with Pepe, Van Nistelrooy and Heinze. "Good players are always welcome. Cristiano is fantastic." "He is very young, but he has a lot of experience after playing in the World Cup, Euro, Champions League and English competitions. He is strong both physically and technically. He's got it all." "We are very good friends. We connected well when we both played at Manchester." "He is very intelligent and an outstanding football player." "I think having Cristiano on your side is always the best option. 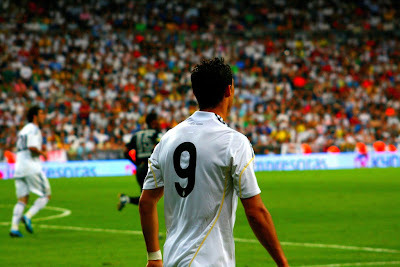 He likes Real Madrid and has always dreamed about playing here, and he likes the city." "Cristiano is a first-class player. He is the whole package and solid at set-pieces. He can determine the outcome of a match in a matter of seconds."